Great Pill Timer/ Pillbox combination. Easy to set timer repeats at the same time every day. Never forget to take your medications again! Four Doses per Day pill holder. Pillbox has a sliding tray with two compartments to the left and two compartments to the right (see below). Pill capacity is eight (8) aspirin sized tablets per dose. Avoid Medication Errors. Makes a great gift. Free Standard Shipping for all US customers! Free Gift with every order. "I love my MEDGlider. It reminds me to take my medication so I don't have to watch the clock." The e-pill MEDGlider is a practical Medication Reminder Timer and Pill Box for remembering daily meds. Great gift idea. 30-Day Money Back Guarantee. 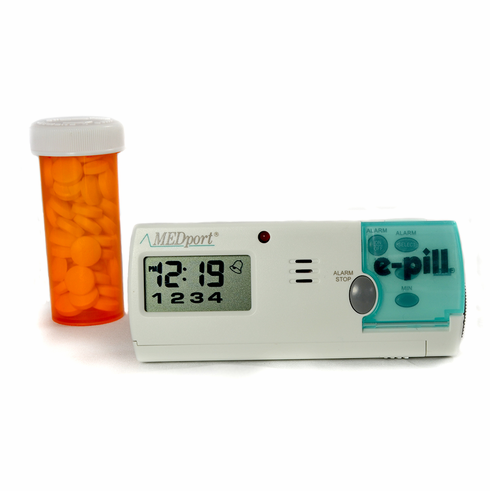 Popular e-pill medicine timer. Price includes FREE batteries. The daily pill box has four compartments with room for multiple pills, capsules, and tablets. NOTE this e-pill only has ONE PILLBOX. Included tray allows seven (7) day medication pre-planning. Reminder unit can be used stand-alone or with the daily organizer attached. Ensure patient compliance and well being - order your e-pill MEDGlider today! FREE Standard Shipping (US only), 30-Day Money Back Guarantee. Never forget to take your medicine again and feel better! Removable compartment walls: You may remove One or Two walls (dividers) to make it a 3 doses per day or 2 doses per day pillbox.